Sites for our soil samples: Site 1 was on the side of a hill (where people are gathered) and Site 2 was in the wash at the foot of the hill. On my fifth day at Zzyzx Road (Thursday, March 22) we turned our attention to the soil mechanics and chemistry of the Mojave National Preserve. We traveled with soil experts from the Natural Resources Conservation Service to conduct several digs of soils typical of this area. Soil Trench 1. The lime layer is about 6 inches down. 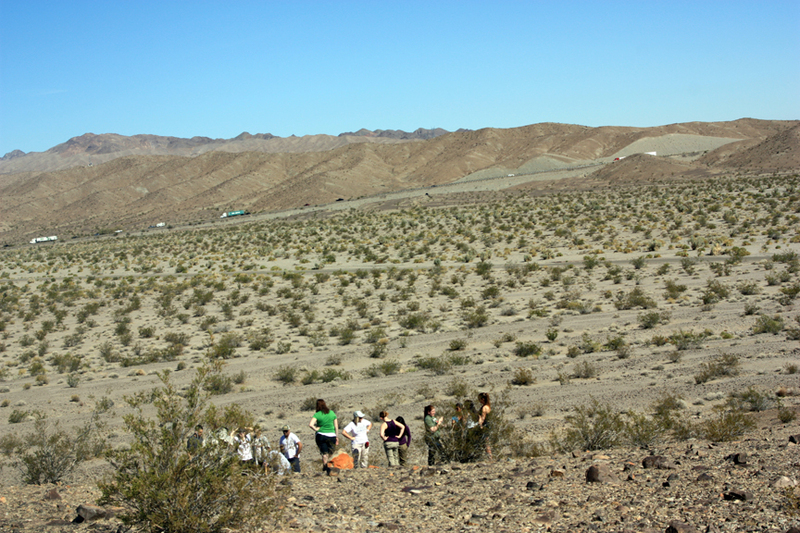 About one mile off I-15 along the south side of Zzyzx Road we climbed a low hill and dug a small trench into the soil about three feet deep, keeping the upper slope sharp so that we could look at the soil profile. At first glance this hill would seem to be volcanic (that’s what I thought as I drove past it coming in) but it had a mixture of rocks carried down to it from uphill, and the hill itself is probably an erosional remnant. Across the freeway we could see similar layers, mostly ancient, tilted limestones. 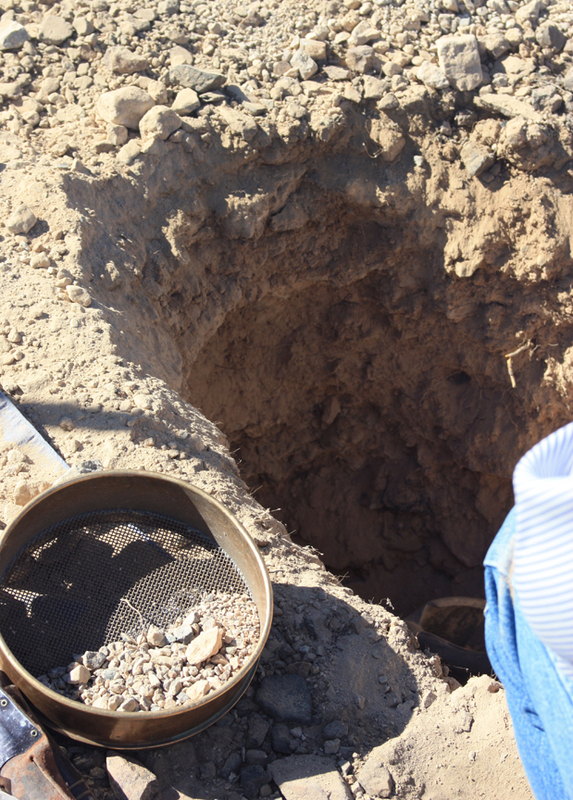 Digging down, we found fairly well sorted layers, some containing mostly sand, others small pea gravel, etc. About six inches down was a hard white layer that looked almost like chalk – which is what it basically turned out to be, as it fizzed quite nicely with a simple acid test. As the limestone uphill erodes, it dissolves into the runoff water and is carried downhill and soaks into the ground, turning into calcium oxide. But the rains here are so infrequent that the lime doesn’t soak in further than about six inches before it deposits out, much in the same way cave formations precipitate from solutions in caves. 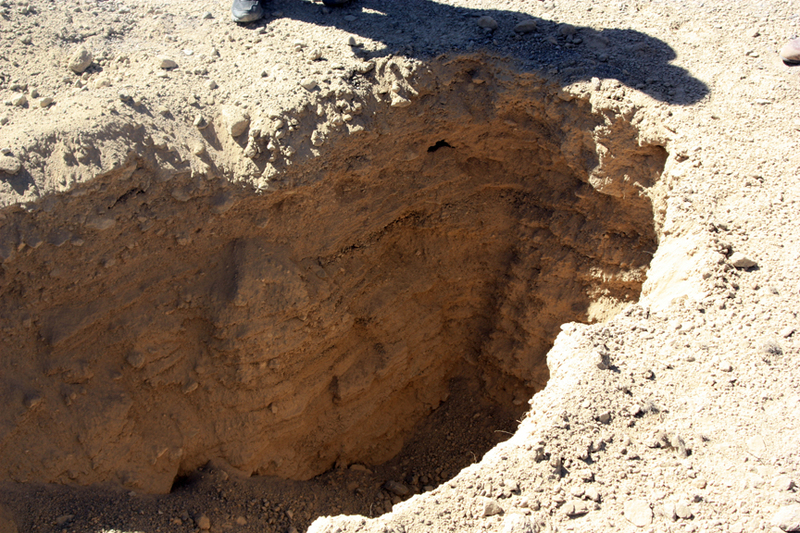 This hard, alkaline layer combined with low humus and low rainfall makes this soil inhospitable to most plants, but there are a few that manage through some remarkable adaptations. Soil Trench 2, in the wash near Zzyzx Road. My personal favorite is the ubiquitous creosote bush. Each bush is an island of life, with small plants growing in the decayed material under the creosote’s shade. The creosote leaves are small and intensely green, covered with a pungent waxy sap that prevents evaporation. This chemical is extracted and used to coat railroad ties to prevent them from rotting. Its most amazing adaptation is the root system, which extends into the soil through the lime layer and down about 12 feet, spreading out underneath. 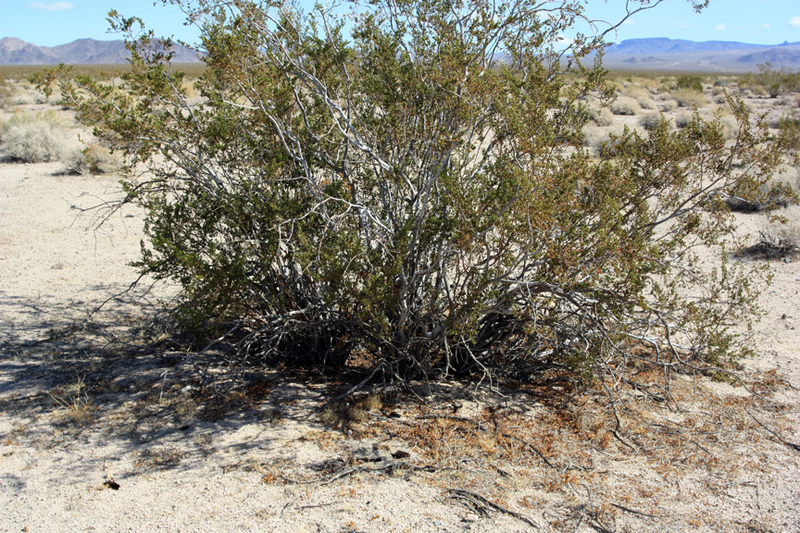 This is why creosote bushes don’t grow in clumps but are separated by about 12-20 feet on average. This huge system of fine roots is able to draw out any moisture that exists in the soil. We saw the roots extending down through our profiles, forming an important part of the desert ecosystem. We also used a backhoe to dig a trench into the soil in a nearby wash (which had some young soil crusts beginning to grow). We used soil sieves and water to separate the materials and get a rough estimate of the abundance of sand, silt, fine pebbles, and rocks. 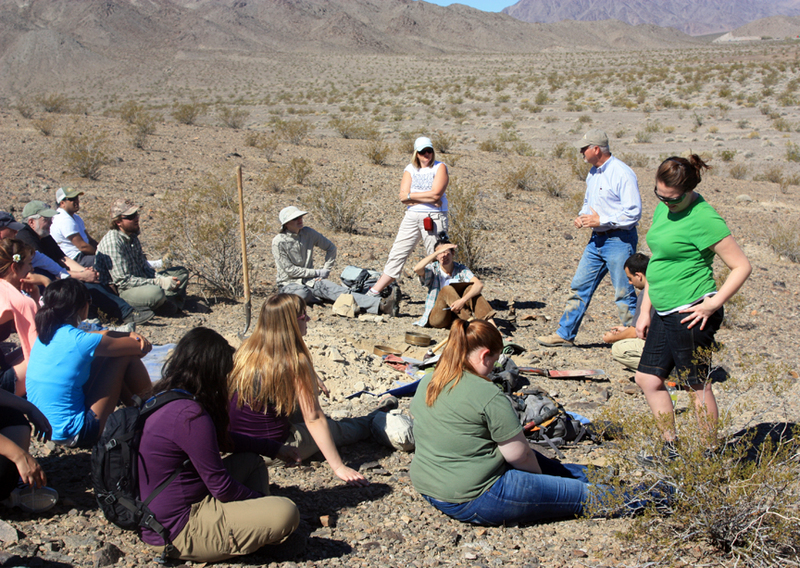 This data is being used to map the soils of the Mojave Preserve, much as geologists have already mapped out the rock outcroppings. On a geological map, the valley floors are simply listed as “unconsolidated fill.” These studies will help add more detail to the maps. I find myself drawing comparisons between the soils here and what I grew up with in the Sevier Desert of western Utah, part of the Great Basin province. My hometown of Deseret lies on an ancient delta of the Sevier River, and the river runs through it (right past our house). Features along the Sevier River drainage system in Millard County, Utah. In the past, before being used for irrigation, the river would see large spring runoffs since it drains a large area of central Utah. In fact, if you stand on the ridge at the top of Bryce Canyon National Park, everything in the canyon and beyond drains into the Paria River and eventually into the Colorado and to the Sea of Cortez. Everything behind the ridge drains into the East Branch of the Sevier River. This ridge is a watershed divide. The West Branch drains the back side of Cedar Breaks and Panguitch Lake. The river then travels along U.S. 89 to Yuba Lake, where it hooks through Leamington Canyon and then southwest past Delta to the Gunnison Bend Reservoir and on through Deseret, eventually ending in Sevier Lake, which now is mostly dry. Before irrigation, the river cut a series of distributaries as it left the bluff north of Delta, and it was a large runoff that cut a new channel one mile north of the first settlement of Deseret, leaving the town high and dry. The Old Mud Fort is actually on the north side of the old settlement. The town was mostly abandoned, until my own ancestors came from the area at the mouth of Zions Canyon to resettle Deseret at its present location. Yet the river is still not entirely tamed. 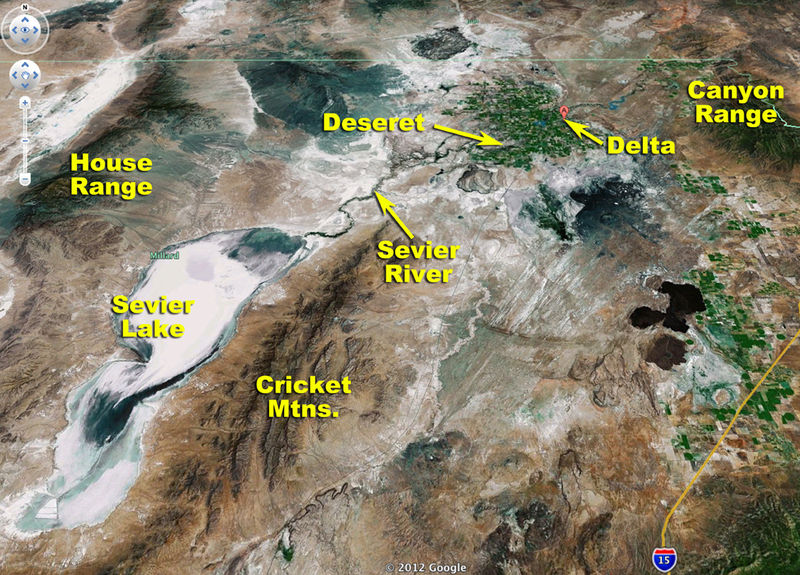 In 1983, a very large runoff caused a dam north of Delta to burst and Deseret was flooded. I spent much of the remaining summer cleaning up the mess. We had an even bigger runoff last year (2011) but we’ve learned a few lessons from the 1983 flood and were able to make room for all the water, even allowing some of it to flow unused down to Sevier Lake. All this runoff took any minerals from the central Utah region, including large salt and gypsum layers near Richfield and Salina, and deposited them in the soils as the water spread out, leaving high salt and alkali content. I’ve tested the soils around Deseret and my father’s farm and they average a pH of about 8-9 (in some places almost 10). The alkali creates white-rimed hardpans in places where nothing will grow and only alkali bees can live. The Sevier River water has about the same pH – after being passed and drained through farms all along the river, it is very brackish by the time it reaches us. It’s a miracle that anything can grow besides greasewoods and rabbit brush, yet with crop rotation and fertilizers, along with drainage channels and an excellent irrigation system of canals and ditches, we are able to grow good crops of alfalfa, corn, and grain. 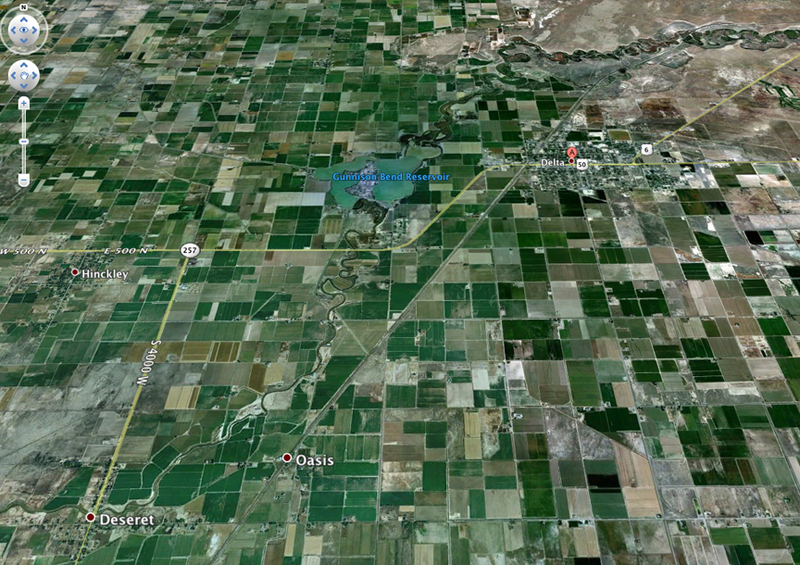 Area around Delta and Deseret, Utah. But the soil chemistry does exact a toll. The ground water aquifers that we used for drinking water not only had a high level of natural fluoride in them (we’ve got tough teeth) but were found to have high levels of arsenic salts as well. No one knows the original source of the arsenic, just that it’s there in the groundwater. New wells had to be drilled that went deeper, beyond the contaminated zone, and a town water system installed instead of individual family wells. My chemistry students sometimes wonder what chemistry has to do with them. I point to the example of arsenic in my groundwater as just one way that the elements have affected me.